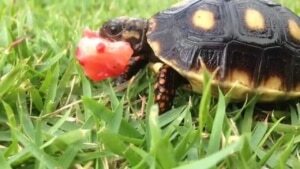 Baby red foot tortoise care is very important. Your heating source should be positioned at one end of the tank, creating a hot basking end for your tortoise. The opposite end should have no heating, creating a cool end. Place your thermometer and / or thermostat sensor on the floor in the middle of your vivarium, at this point in your tank the thermometer should read 82-84oF and should be maintained for 24 hours a day, the best way to achieve an accurate temperature is with a thermostat. UV lighting is essential for 12-14 hours a day. The UV tube should start against the wall at the hot end and span 2/3 the length of the enclosure thus creating a UV gradient much like your heating. It is best to position your UV tube 6-9 inches from the ceiling of a 2ft high vivarium with a reflector. Always remember to replace your UV tube every 6 months unless the manufacturer suggests otherwise. . 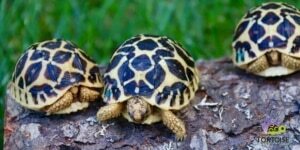 There are several good substrates for tortoises, a good quality orchid bark is recommended, and it is certainly the best for tortoises from humid regions. Tortoises from dryer regions fare much better on beech chip. No tortoise should be kept on sand. Always provide your tortoise with clean fresh drinking water; tap water is fine. Your tortoise requires somewhere to hide, provide it with a box containing a good quality rabbit hay. The hay provides a comfortable bedding and is also very useful as part of your animals diet. Many different feeding routines and diets have been used with varying levels of success the best suited to this set-up will be explained below. Tortoises should be given 3 wet meals a week and access to as much dry food as it like. A tortoise’s wet diet is made up of 90% leafy greens, such as Rocket, Endives, various salad leaves and selected weeds. The final 10% is made up of fruits and vegetables to add colour and flavour. See later list and online guides for safe foods. The dry part of its diet is very important. The hay used as bedding can be eaten and chopped to mix with the wet food to add a little more roughage. Alfalfa can also be left in the enclosure or mixed with the wet food in the same way.As a general rule we like to leave a good dry pellet food in the enclosure at all times. Do not add to much water. The point of this is to allow your animal to fill up on a low water content food so they don’t gorge themselves on high water content foods. It’s worth noting that the Tortoises mentioned in this care sheet come from fairly arid regions and eat a large amount of roughage. They come across very little fresh growth other than early spring and can only find fruits when they fall from their plants for a very brief period of the year. A high moisture diet is a common cause of grown deformities such a shell pyramiding. It is worth remembering that if you take foods from outside to check no pesticides or fertilizers have been used nearby.